Textransformations is a sculptural installation and an interactive reading experience. 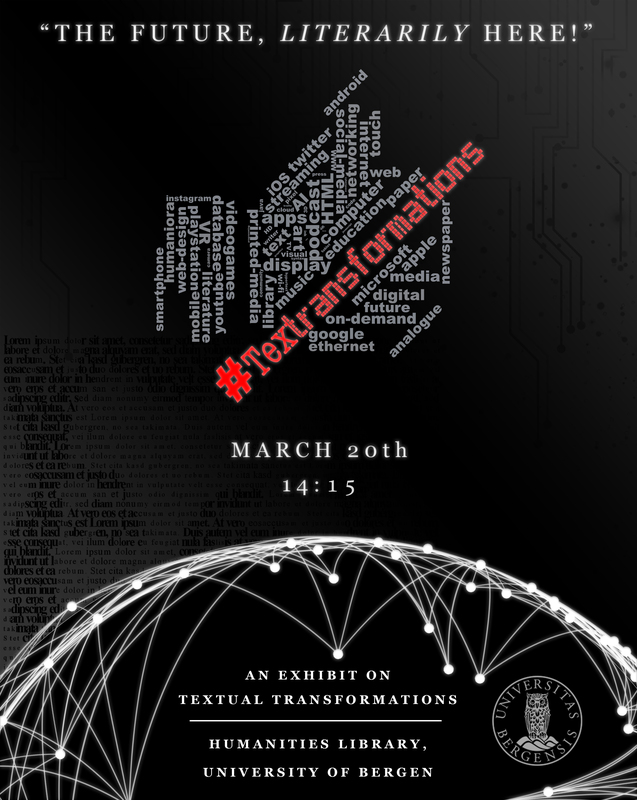 The exhibit is an invitation to consider the transformation of textuality from analogue to digital form. 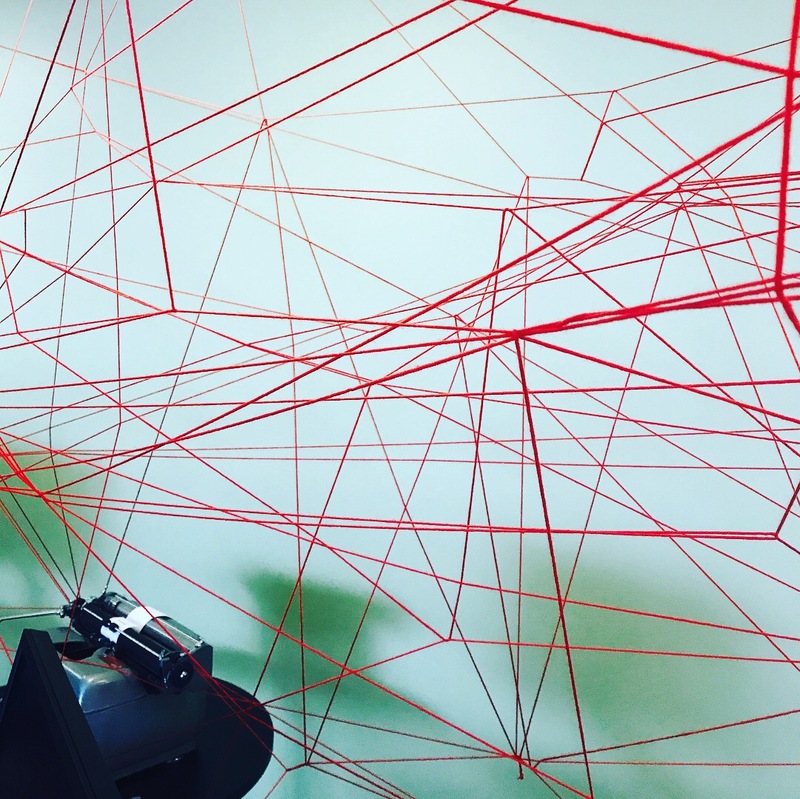 The red thread prominent in Scandanavian design1 is harnassed to visualize digital networks, which have radically reorganized our experience of communication. A new form of transmission – of our words, our voices, our ideas – is symbolically rendered in this tangled net. The sculpture is inspired by Chiharu Shiota’s thread constructions, but reinterpreted here as a complex web or a neural network. It is a representation of the dynamic and emergent pathways in which we now share ideas and information in the digital age. Textransformations also features multiple found objects that have been discovered in the annals of the Humanities University Library at UiB. It has been fun to search the subterannean parts of this library, discovering what has been cast aside. A typewriter, the old card catalog, a book ladder, remind us of recent but radical change. Searching the storage areas and basement has inspired me to integrate such found objects as relics or ruins. In addition, the discarded cards of the library catalog serve as a reminder of a not so distant past, of a different way of organizing our knowledge. 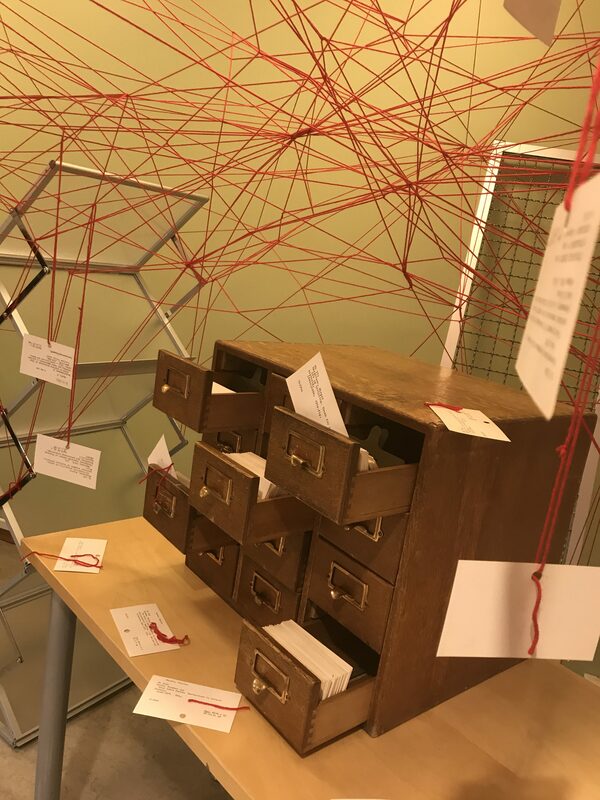 The card catalog was a familiar sight to library users for generations, but it has been effectively replaced by the data networks of the digital age. Like leaves falling from the trees, we are shedding these old frameworks, and growing something new. The result of this shift from analogue catagorization to open digitized networks can be realized in the way we tell our stories. Laced throughout the installation are hot spots marked by QR codes. Each hot spot is a clue to new forms of textuality and digital storytelling. Helping to amplify this interactive aspect of the installation, my own avatar (a digital alchemist known on Twitter as M Prophetissima) whispers her way into the fray by announcing Textransformations. She hints at knowledge to be discovered here. The viewer is invited to use their cell phone to search and interact with the installation. Scan these hotspots to discover the influences and forms of narrative transformation. In the far corner installation web, you can also compose (or remix) former literary texts a new. You are all invited to play with “found” words. Add your own cut-up poetry to the installation. Finally, this project is collaborative. The digital network is only as productive and dynamic as those who share and expand it. I have incorporated into Textransformations a showcase of my UiB students’ work. In the Fall of 2017, I taught a course entitled Writing Electronic Literature (Dikult 203). This Spring 2018 I am teaching a course entitled Networked Narratives (Dikult 103). In each of these courses, students have co-learned in an open networked setting. You can explore the digital visualization of our unique and ever-evolving learning network, as well as examples of student creative work. I welcome you to explore all of these Textransformations. 1The red thread is a metaphor for something distinct found in Nordic aesthetics – a focus on design as a means of enhancement and functionality. It is a shared characteristic, weaving together a special sensibility (like the long connecting thread in woven material).